Zerodiv is bringing Psikyo's classic shooter Gunbird to the Switch eShop this week, it has been revealed. Originally released in 1994, Gunbird was later ported to the Saturn and PlayStation and was followed by a 1998 sequel which saw release on the Dreamcast. More recently, the two titles were bundled together in a PlayStation 2 collection. It will cost $7.99, which is significantly less than the Japanese Saturn version retails for these days. Excited? Let us know with a comment. 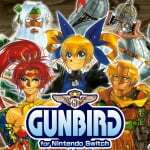 We already had Gunbarich, so it's only natural we eventually got Gunbird as well. They're very good games in their genre. I'm definitely picking this up! I never got a chance to play this, and I loved Gunbird 2, so it's gonna be a day 1 pick for me! Release that damn Zero Gunner 2!!! Hell yes. Having this game portable will be so much fun. I'll grab every Psikyo game they put out day one. Also, one step closer to finally seeing a home release for Space Bomber! Loved Gunbird 2, so sure. I'll take it. Sweeet. Could do with Twinkle Star Sprites sometime too! Racers and Shmups...I’m in Switch heaven! That vid is exactly how I play smhups: ride the best weapon and spam the special weapon at the bosses, lol. This needs to come out as part of a physical collection. I have the second one on Dreamcast, it'll be nice to finally have both games. Anyway, this December might end up being the turning point for the shmup genre which has been in decline since the end of the 360. The Switch gets Gunbird and Dimension Drive on the same day, RXN Raijin has been confirmed for December and i'm somewhat confident that Zerodiv might manage to release at least one more Psikyo game. Love me some shoot-em-ups. Can't wait! When did people start saying shmup instead of shoot-em-up? It really irritates me! @Hen1roc what do you mean? you can play it vertically to fill up the whole screen. Huge shumup fan so I will be getting this. Another nice arcade game shaped surprise for us retro-loving Switch owners. Honestly, so happy to see arcade games of 80s/90s vintage come to Nintendo's hybrid system. Emulation is great of course but I personally love seeing these games get official releases on modern hardware. Welcome back zerodiv. You have been missed. But for some reason they are still fun to me and well, unlimited continues means I can play til the credits and still work on my pattern recognition later. More than likely, I'll be picking this one up too. That MUSIC!! @Shinnos since 1986! Where have you been? I hope Sengoku Blade is next! Definitely going to be getting this - I can't wait! This is one of those games I have heard people talk about for years. I am excited to finally give it a try though I am not very good at this genre.... time to practice! YES! I've been waiting for Zerodiv to do more with the Psikyo catalog. So many good shmups left: GunBird 2, Strikers 1945 II, Strikers 1999, Strikers 1945 Plus, Dragon Blaze, Zero Gunner II, and my all-time favorite Psikyo shmup, Sengoku Blade! I think this was the game that got a massacred "localization" on the PS1 as Mobile Light Force? I bought the Japanese original PS1 version but I was shocked to see the butchered version going for almost the same price physical (it was rereleased on PSN, I think) along with its "sequel" the butchered version of Castle Shikigami 1. But will it allow for turning the Switch 90 degrees? I've never heard of this. Seems interesting. What a great game! I'm not sure if they hold the rights to Battle Garrega also, but that's another super-expensive Saturn shmup in desperate need of a digital release. Zerodiv's previous Psikyo releases on Switch (Strikers 1945 and Gunbarich) both did. Looks cool, and nice music.